Who doesn’t love potato or tortilla chips? The only problem is most are loaded with bad fats, excessive sodium, and calories. I honestly do try to steer clear of them for those reasons and how they help to put on the pounds. However, I discovered a fantastic replacement for chip hunger with healthier Corazonas potato and tortilla chips that I was sent for this review and giveaway. The Corazonas potato chips have 40% lower fat content than regular chips. Their tortilla chips have 18 grams of whole grain and both varieties are infused with plant sterols that are proven to lower your bad (LDL) cholesterol. Read more about the health benefits of their chips here. Now you wonder something so healthy could it taste good? Corozanos didn’t shortchange in the flavor department in any of the flavors I sampled from their potato chips in Parmesan Peppercorn, Sea Salt & Vinegar, Italiano 4 Cheese, and Spicy Rio Haberero. In the tortilla chips, I tasted Squeeze of Lime, Black Bean & Cheese (Yummy favorite), and the Lightly Salted. Sure, you can enjoy any of the healthy chips straight out of the bag without guilt. Nonetheless, I wanted to show you how else to enjoy these fabulous products and entice your kid’s as well to eat what they may not like (such as their veggies) with a few good recipes I made with use of these products. The first recipe will become a family favorite for ease of preparation. Adding the flavored Corazonas Italian 4 Cheese Potato Chips turns quiche in an exciting new direction with a crunch, which kid’s really enjoy. The second recipe is perfect for when you have leftover chili and need to reinvent. Besides, being the perfect quick summer meal, this dish is scrumptious. The whole family will gooble this one up and demand more. The last recipe is a great way to fool your kids into eating their veggies with this Crunchy Veggie Casserole. Trust me, and you stick their least favorite inside and add my simple sauce and crunchy topping and those reluctant eaters will clean their plates. unbaked 10″ pie crust to fit your quiche pan. Prepare my Oil Pie Crust for flaky, no fail crust first or any pie crust to fit into greased quiche pan. Turn on your oven to 400 degrees. 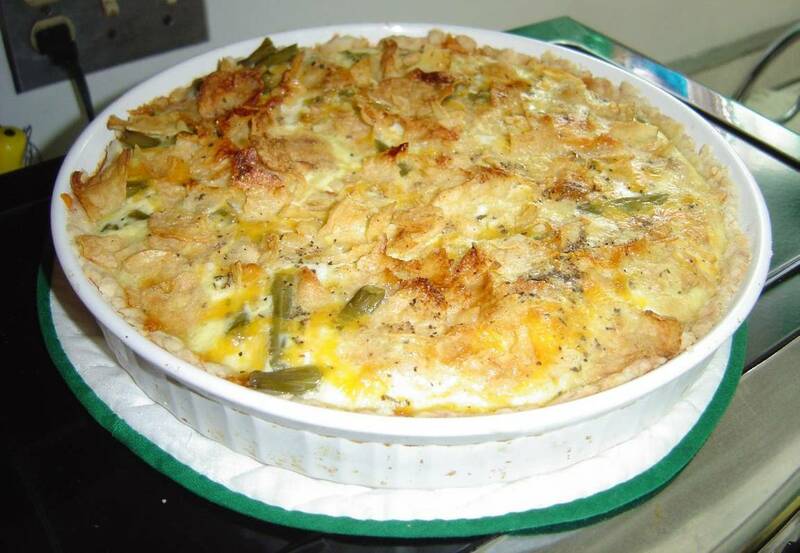 Next, place your drained green beans at the bottom of your shell, shredded cheese, then broken chips over the cheese. Mix your eggs with your milk, basil and pepper to combine well. Pour this mixture over the ingredients in your quiche pan and bake for about 40 minutes or until a knife inserted comes out clean. My Disappearing Crunchy Chili Salad! Mix your oil, vinegar, pepper,salt, and sugar together for your dressing. Pour over the shredded lettuce. 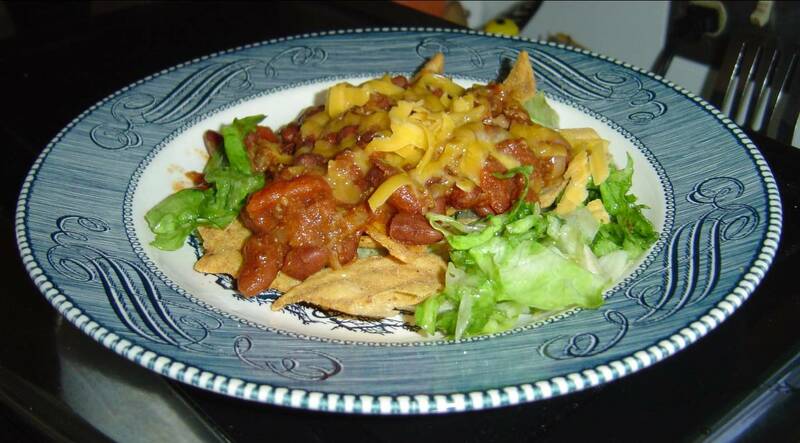 Add some to each plate, then add some your reheated chili to each plate, next some broken chips and then layer some shredded Cheddar over each dish. You can eat or zap them for a extra few seconds in the microwave to melt through. 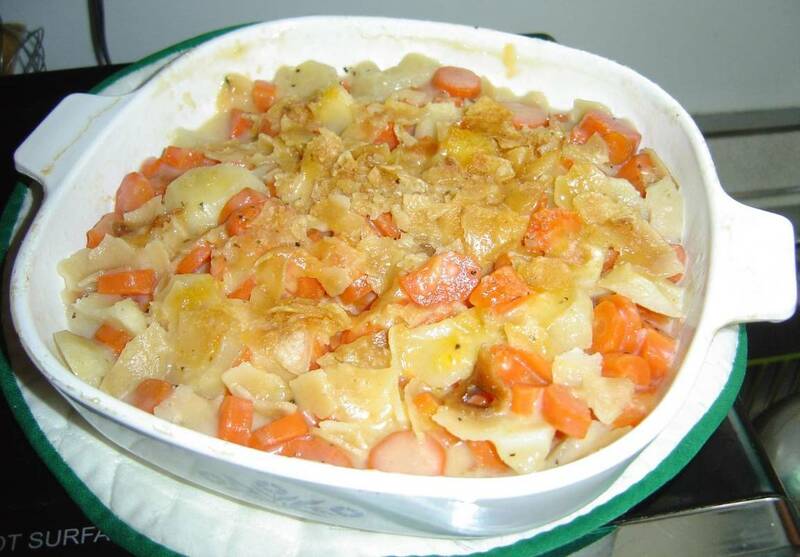 Precook your sliced potatoes and carrots until almost done when stabbed. Mix your cornstarch with your cold milk and thicken on your stove with the Velveeta Cheese until you get a creamy cheese sauce of your desired thickness. Add salt and pepper. Layer your potatoes and carrots and add cheese sauce between the layers. Top with the broken Corazonas Slightly Salted Potato Chips. Reheat in your microwave for a minute or two to heat through until bubbly. Serve immediately. You can buy Corazonas online or find a store near you here. 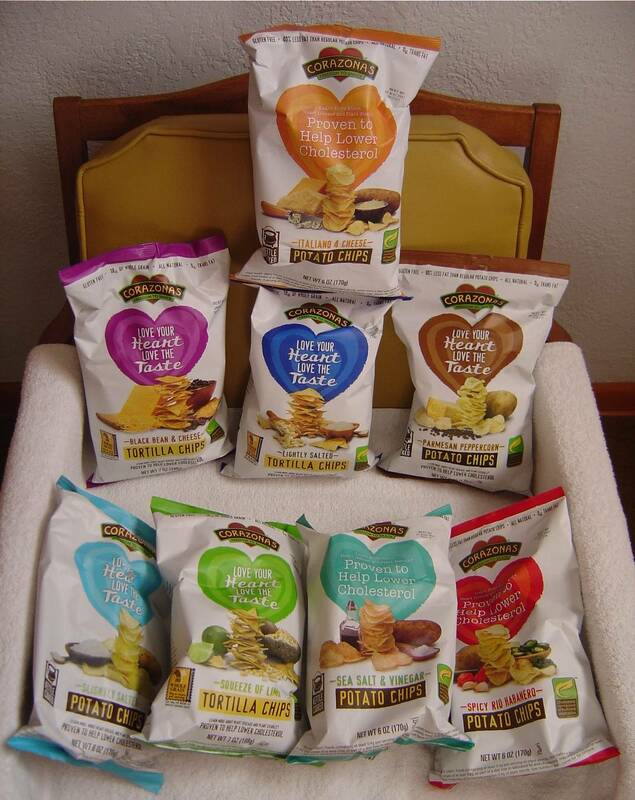 Thanks to Corazonas, one lucky Nuts 4 Stuff reader in the United States wins a case of their chips in the flavor of their choice! 1. You must follow me on Google Friends Connect before any of your entries will count. If you already follow, then tell me the name you follow me by in a comment with your email! 2. Go to Corazonas and tell me which product you would love to try also or something you learned from the site in another comment. This giveaway ends July 22, 2011 at 12 PM Eastern Standard Time. The winner will need to respond to my email with name and shipping address within 48-hours or another winner will be picked. I follow via GFC and I would love to try the chocolate brownie & almonds oatmeal squares! I would like to try Corazonas' Spicy Rio Habanero potato chips. Plant sterols can help reduce the absorption of cholesterol in the small intestine by up to 50%! I follow on GFC and I'd like to try the Salt & Vinegar Potato Chips. I'm a GFC follower (Gianna).Cranberry Flax Oatmeal Squares. GFC follower: Atreau.I would love to try the Parmesan peppercorn potato chips. I follow (dvice12). I'd like to try Italiano 4 Cheese. Kandi Smithklbs1[at]yahoo[dot]comI would also like to try Corazonas' Chocolate Brownie with Almonds! Sounds yummy! Kandi Smithklbs1[at]yahoo[dot]comI already subscribe to you by email at the above email address.